We employ three main types of trucks for sea container delivery. Depending on the container specifications and your land area, we will choose between the tilt tray, side loader or hiab to transport your container. While operating the trucks, our drivers are vigilant of all people in close proximity, and careful in their actions. At Sea Containers, our top priority is the safety of all persons. Once we have reached your location, we will expect to find a clear and level area ready for the container. It is vital for the lay down area to be dry and firm, and the path sealed or compacted. If the ground conditions are not as such, we need to be informed prior to the delivery, as any truck recovery costs will fall onto you. Container footings are a strong recommendation, as they raise the container off the ground and allow for air flow underneath. Footings stop moisture growth and increase the life of your container. Our recommendation is to use treated hard wood, concrete blocks or used car tyres to ensure the longevity of your sea container. 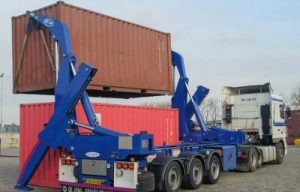 The Title Tray is the ideal transport for 10’ and 20’ sea containers, while the tilt semi is used for the 40’ containers. However, side loaders are usually the first pick for the 40’ containers. There needs to be sufficient space for the truck to deposit the container. 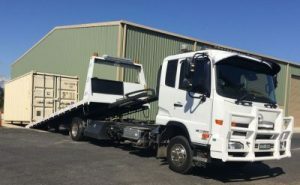 Like a tow truck or tip truck, a tilt tray reverses into place, lifts its tray and slides it back so that the container is in contact with the ground, and then moves forward slowly so that the container slides down onto the footings or ground. The side loader semi trailer is the most common choice for a 40’ container, though it can be used for 20’ containers too. The side-loader features a swing lift to hook onto and pick up the container from its sturdy corner casts. These trucks are useful for delivering to locations where there is minimal space to the front and back of the truck. This is because the truck offloads to the side, approximately 500 mm from itself. 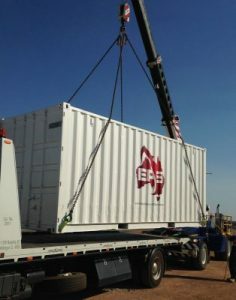 Hiabs transport all size sea container; the 10’, 20’, and 40’. Hiabs have a crane attached to one end, allowing them to transport containers into areas that cannot be reached by other trucks. These trucks are great for getting containers over impediments such as fences. Hiab trucks have stabilizer arms to balance the crane arm in the task of picking up and setting down containers. So you can expect a perfect and precise positioning. Length Allowance: 20’ Hiab needs 10m; 40’ Hiab needs 15m.